Mark Joseph Stern writes for Slate that Ginsburg's comments have been called "explosive, unprecedented, and unethical," by both liberals and conservatives, and he agrees that what she did was "dangerous" as well as a breach of ethics. But he says that's exactly Ginsburg's point, and it may be a strategic one in which she's willing to give up her "good name" and "sacrifice some of her prestige … to send as clear a warning signal about Trump as she possibly can." Ginsburg "abandoned judicial propriety to wrestle in the mud with a candidate she detests," he writes. "It is not pretty, it is not pleasant, and it may not even be that smart. But it may be the one thing the justice can do to help prevent a President Trump." His entire take here. The New York Times editorial board notes that Ginsburg has done nothing illegal—but it's sort of siding with Trump on this one. The paper points out that Antonin Scalia's recent death in an election year makes a new president's possible influence in picking a new justice especially critical. 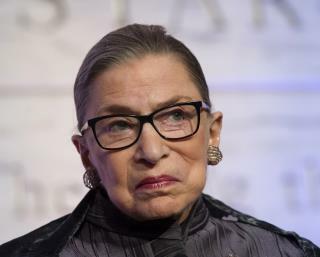 It calls it "baffling" that Ginsburg would stoop to his level and "call her own commitment to impartiality into question," adding that DC already has enough partisan issues "without the spectacle of a Supreme Court justice flinging herself into the mosh pit." The Washington Post adds that not only were Ginsburg's remarks not illegal, they weren't surprising, given her feminist history, nor were they necessarily untrue. But it agrees with the Times that her "off-the-cuff" statements were "inappropriate" and probably best never spoken. "Politicization, real or perceived, undermines public faith in the impartiality of the courts," the editorial board writes, citing the Code of Conduct for United States Judges' section on refraining from political activity. "[Her comments] fall into that limited category of candor that we can't admire, because it's inconsistent with her function in our democratic system." Donald Trump himself addressed Ginsburg's shade with the New York Times on Tuesday, but he added more thoughts on Twitter early Wednesday, tweeting, "Justice Ginsburg of the US Supreme Court has embarrassed all by making very dumb political statements about me. Her mind is shot—resign!" Justices should not make partisan remarks about candidates in my opinion. It's not illegal, but I don't think it's a good idea either. And I would be equally concerned if a justice made a comment against Hillary. It's best not to do it at all. For the record, I agree with her assessment. Typical conservative-run media at work, as usual. How dare she be Politically Incorect! !